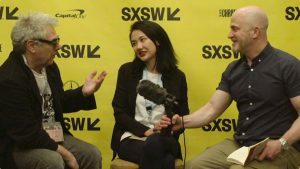 I met with director Yuqi Kang, of the new documentary feature A Little Wisdom (which I also reviewed), on Sunday, March 13, at the 2018 SXSW Film Festival, with my Fog of Truth podcast colleague Bart Weiss (of Dallas VideoFest) joining me for the conversation (in fact, we used this interview in the first episode–201–of our 2nd season, available on iTunes, SoundCloud and Stitcher). The film follows a group of young Nepalese boys who are monks-in-training in a monastery in Lumbini, birthplace of the Buddha, focusing primarily on 5-year-old Hopakuli, his older brother Chorten, and eldest boy Vija (who is about 11 or 12). Sharply observed and beautifully shot (partly by Kang, herself), the documentary is a model of fly-on-the-way filmmaking. Here is a condensed digest of our conversation, edited for length and clarity. Hammer to Nail: First of all, how do you pronounce your name? HtN: “You-ghee Kong,” with a “g” sound. 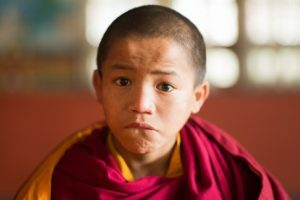 HtN: So, this film profiles a group of young boys in a monastery in Lumbini, in Nepal on the border with India…How did you get access to film to film in that location? YK: So, in 2011, I backpacked to Nepal, and did some volunteering there for three months. And then, I went to Lumbini, and found that place really amazing, and I asked if I could stay in the monastery. So, they let me do that, and I asked if I could take some photos. I ended up staying there for almost a year. At some point, I started to teach drawing to the boys, and then, finally, I was like, “Can I make a film about my experience in the monastery?” And I think, after maybe 8 or 9 months, they said OK.
Bart Weiss: So then how did you choose, once you got in, your main subject, who is so interesting? How did you come to him and make that relationship work? YK: So, there are about 40 monasteries. I tried to live in each monastery for about 2 weeks, or a month. And, basically, I guess it’s like a casting process, and he [Hopakuli] had this really strong camera-presence, and his story was also really compelling. And on another level, I felt we had a really strong bond; he was really attached to me. So, it just really all came together. BW: Yeah, you really seemed to click. BW: And certainly, for somebody that young to open up in the way that he does, and seem very natural, is one of the things that is very powerful about the film. HtN: I would agree. I have a question, then, about permissions. Some of these boys are orphans, and some of these boys have just been put in the monastery as a sort of boarding school. So, from whom did you have to ask permission to film them? HtN: (laughs) That makes sense. When you’re 8 or 9 or, in the case of Hopakuli, much younger, you don’t think through the ramifications of agreeing to be filmed. BW: Yeah, young people don’t realize what it means to put something on Facebook. (everyone laughs) It never goes away. They don’t understand the long-lasting power of it. So, one of the things I found really fascinating about the film is that you really get to see boyhood, and how kids act amongst themselves in a very, very male society. How did you come to this from your own perspective, looking at that culture that you were shooting? YK: I think, at first, I had some ideas of what boys in monasteries are like, but once we started interacting, it became really clear that they were just little children. I didn’t even realize until the film was finished and there were some audience reactions, that this behavior was universal…everyone – not me, as I had been a young girl – had these shared memories of being young boys. BW: Yeah, and particularly in those situations where he [Hopakuli] is getting beaten up. HtN: Sometimes by his older brother! HtN: And speaking of that, if I may ask a follow-up…One of the things that struck me as really fascinating is the boys’ interaction with 21st-century technology. On the one hand, they’re in this ancient tradition, in the monastery, but then here they are looking at an iPad, watching a movie. And what does Hopakuli want to do? He wants to be in a comic book, and be an action hero. Did any of that surprise you when you first showed up and started studying life in the monastery? BW: All of the things we tend to associate with monks are mostly not there, and it makes me wonder, what is this character going to be like, 15 years from now? Will he turn into a monk, and have those wise things to say, and be secluded and chant? But, you know, kids are kids, and this really shows them fighting and playing, their dreams, their hopes and…playing video games. HtN: One of the other things I found fascinating, because I love observational documentaries, is your choice to include no interviews, and make it purely observational. And it’s beautifully photographed; I love that shot of Hopakuli walking down the road when he goes to buy breakfast, and he sort of disappears into the mist. Hoe big was your film crew, and what camera did you shoot on? HtN: Tabha is your producer? YQ: My co-producer, yes. So there were three of us, and we each shot equally. HtN: So, three of you were shooting. YQ: Yeah, and we had two Canon C300 Mark II cameras and one Canon C300. We shot for roughly 4 weeks. And they are both also filmmakers, themselves – they direct their own films – so we had this unspoken understanding of the story I wanted to tell. So, there were not a lot of directions, in terms of what they are shooting or I am shooting. We usually just went out and did our own thing. HtN: So, you had basically three different units, just photographing what looked interesting, and then you assembled it later. BW: So, do you want to talk about post-production? You obviously shot a lot of material, and when you’re shooting in an observational style, finding a through line to make it work is probably a little more challenging than in a traditional doc. So, how long did it take to edit it, and how did you find the structure? BW: Yes, I know Alan. He’s a wonderful filmmaker, and you see his credit, as an advisor, on a lot of films that are really good. He’s just so sagely. And also, among other things, his films are just so tightly constructed, that he thinks about editing in such a forceful way, and his films are so deeply personal. HtN: I read, in the press notes, how you, yourself, are an ethnic minority in your home country of China. You are from Mongolia. How did that inform your filming of these boys in their environment? What understanding of their particular situation did this give you? YQ: I have never really thought of myself as Mongolian or Chinese, until I started to make films. I think it’s easier for me to relate. Even though I am ethnically Mongolian, I moved from inner Mongolia to Beijing at a very young age, and then I moved again, to Canada, and then to the U.S. So, I didn’t think I had any labels to myself. When I met those boys, I felt that I was just part of them, once I lived with them. Sometimes, I just forgot I’m an adult, in that situation. And their culture is also universal. HtN: That makes a lot of sense. BW: One of the things that struck me so much about the film is that “boys will be boys” is a kind of universal thing, and we’re in this “me too” moment, when we are really questioning the role of masculinity and where it comes from, and then you have Trump talking about “locker-room talk,” which is totally about boys beings boys. So, what does this film have to say about where masculinity is in the 21st century? YQ: I think…you know, I’m really struck with the boys’ obsession with heroes and the tough-man persona. I think they got part of that from the media: the films they are watching, the cartoons they are watching. Also, with the sense of hierarchy within the group of boys, I felt strongly that the media has influenced their behavior, in that sense. Perhaps literature, and their traditions of being tough on young boys, also played a part. BW: So, for these kids to become monks, would it be better for them not to have access to media? YQ: Well, as the Dalai Lama said…he encouraged kids, in the monastery, to study all kinds of subjects … I don’t feel that isolation is a solution for them to grow. I feel that, with the exposure, perhaps, they could decide later what kind of person they want to become. Also, I was chatting with this monk – this really great, respected monk – about those young kids, because I was wondering if living in the monastery, for the kids, was good. I didn’t feel like they were being influenced by their religion. And the monk said that you don’t grasp the practice of Buddhist spiritual ritual at that young age, but that will come to them later. HtN: And time will tell, and we’ll see what they become, later. HtN: So, thank you so much, Yuqi. It was a pleasure speaking with you. YQ: Thank you so much! It was really nice meeting you. BW: Thank you. I really enjoyed this.